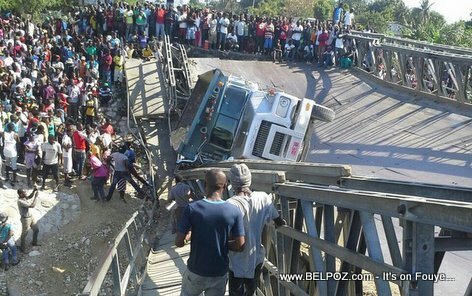 KREYOL: Haiti - Men REZON ki fè Pont Route neuf la tonbe ayè Vendredi a... YO Vòlè twòp VIS ak BOULON nan pon an... se sa kèk moun nan zone lan fè jounalis konnen... Kisa ou panse de sa??? One nearby resident told journalist this has been happening for a while, people have coming to the bridge at night stealing nuts and bolts from the bridge. People come in broad daylight, another resident said. Although they have alerted authorities, nothing was done about it. Why would someone stead nuts and bolts from a Bridge? Similar to America, theft with copper and metal stolen from stop lights, hospitals. A bridge is going far when someone can be killed or injured. There police must beef up and change there style. are Metal and they steal it to sale as Scrap Metal. Can be used to built and secure so many thing, like Wood to wood frames ( charettes in Haiti ) Trailers ( trucks frame, , Steel frames etc > and are quite expensives. Almost the same thing happened on one of the main bridges entering the city of Santo Domingo not long ago, I think less than a year. We - Dominicans - were doing the same thing, stealing steel from the bridge. Quick, deviate Haitian's attention from this problem by banning produces and chickens from the Dominican Republic. Premier fwa m tande yon irréaliste tris konsa.